Bingo Fling | Pick up your Spin the Wheel Bonus! 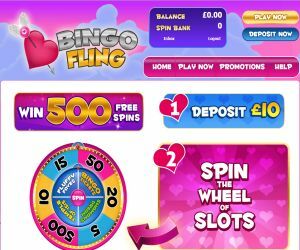 Bingo Fling is the latest site to romance the reels for 2016! So if your looking for red-hot gaming entertainment with a feast of fiery bingo and slot fun, then you'll find it all at Bingo Fling! The awesome new site is the latest release by Jumpman Gaming and operates on the Wheel of Slots Network. When you enter the world of Bingo Fling , Cupid will be waiting in the clouds with his trusty arrow to greet you at the reels, which are dripping with romantic shades of pink, red and purple hearts. You'll be welcomed by an attractive bonus, sizzling promotions, juicy jackpots and FREE spins! So get ready to fall in bingo love all over again and find your bonus match with Bingo Fling! 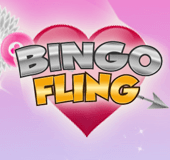 When you enter the romantic world of Bingo Fling, Cupid will welcome you with a sizzling welcome offer! If you deposit £10, then you can give the famed Cupid's Wheel of Slots a whirl for FREE and win up to 500 FREE spins to use on your fave slots like Fluffy Favourites, Temple of ISIS or Shaman's Dream! You'll then be showered with promotional gifts like the £250 Balance Booster on the 15th of every month, the£500 Fortune Fountain Community Jackpot, FREE bingo, guaranteed juicy jackpots and more! You can then head over to the cheeky chat room for more exclusive games and promotions to put a spring in your step and a smile on your account! Bingo Fling is home to a pulse-racing collection of 75 and 90 Ball Bingo rooms, from the Snug and Fun House, as well as FREE bingo. Once you've spun Cupid's Wheel of Slots, you can also get in on the slot-action playing all the hottest slots and instant games like Fluffy Favourites, Sugar Train and Shaman's Dream. Next, you can make your heart flutter and play the jackpot games to rock your world like Fortune Fountain and Balance Booster. Bingo Fling also offers an exclusive Video Bingo room, and there are plenty of more surprises in store to make you blush as you romance your way to jackpot winnings!